A delicious, hearty meal packed full of fresh summer veggies. Line the base and sides of a 20 x 30 cm baking pan with plastic wrap. Heat the chicken stock and in a saucepan over medium high heat. When it is simmering, slowly pour in the polenta while whisking the mixture in the pan. Reduce the heat to a simmer and continue stirring occasionally over the next 10-15 minutes while the mixture thickens. Remove the thickened polenta from the stove and add the butter and the ⅓ cup of cheese. Stir until smooth and creamy. Pour into the prepared pan and smooth the surface. Sprinkle with the remaining parmesan and bake for 10 minutes. Preheat the oven to 220°C. Turn the polenta onto a clean work surface and cut into 8 rectangles. Cut each rectangle in half diagonally. Place the polenta triangles, in a single layer, on a large baking tray. Drizzle with oil and set aside. Heat the oil in a frying pan over medium heat and add the zucchini and eggplant. Cook for 5-6 minutes. Transfer to a plate and set aside. Add the onion to the pan and cook for 2-3 minutes, then add the capsicum and cook for a further 5 minutes. Return the eggplant to the pan and stir in tomato puree. Add tomatoes, thyme and garlic. Reduce heat to low, cover and cook for 15 minutes, stirring occasionally. Remove from the heat, stir through the basil and season with salt. 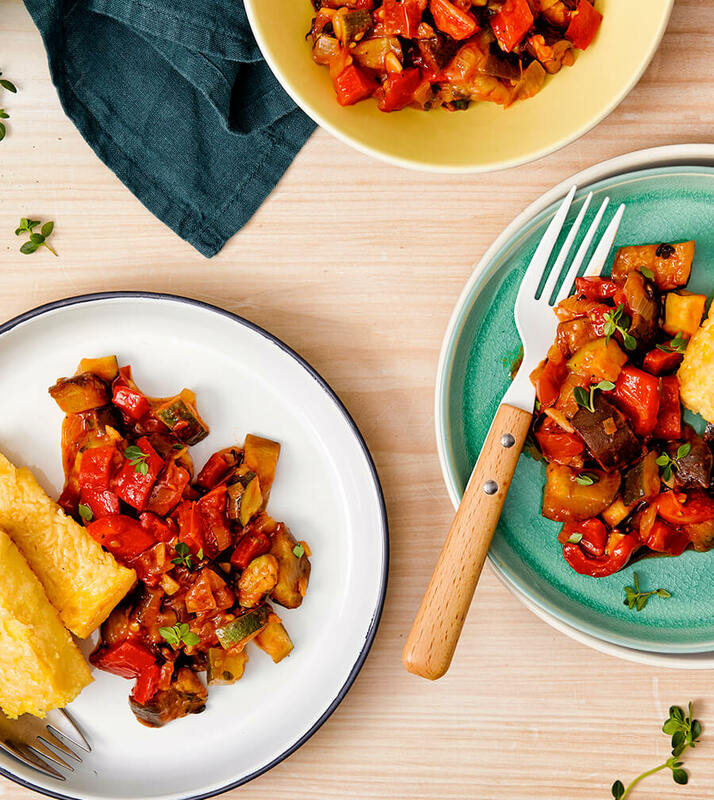 While the ratatouille is cooking, place polenta triangles in the oven and bake for 15-20 minutes or until golden brown. Divide the polenta triangles amongst 4 plates. Top with ratatouille and serve. *Community Co products proudly at home at IGA.